This month, we've been exploring how American women made their place in the marketplace by participating in business and consumption. Recently, we shared the story of Brownie Wise, the woman who spearheaded Tupperware's now famous home-sales model. Wise's work gave generations of Americans (many of whom would have otherwise been shut out of the market) the opportunity to start their own business. Today's post profiles Elizabeth Keckley, a remarkable 19th century African American businesswoman. 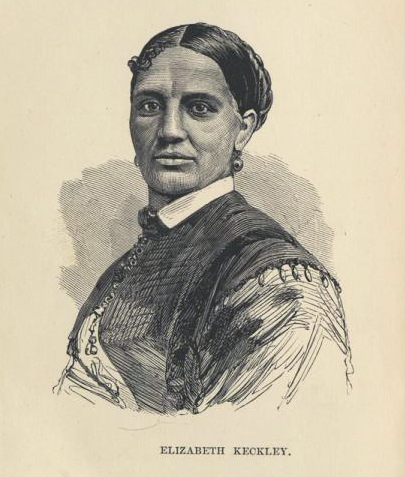 This portrait of Elizabeth Keckley was included in the 1868 publication of her autobiography, "Behind the Scenes, or, Thirty years a Slave, and Four Years in the White House." Although dressmaker Elizabeth Keckley is usually remembered for her close relationship with First Lady Mary Todd Lincoln, the story of her life and career gives us a rare glimpse into the entwined histories of African American business, religion, and philanthropy in 19th-century America. Born into slavery in Virginia in 1818, Elizabeth Keckley learned how to sew from her mother. When her financially strapped owners relocated to St. Louis, Missouri, in the 1840s, Keckley was hired out as a seamstress. While most of Keckley's wages were collected by her owner, she gradually built a reputation as a talented dressmaker. Keckley took great pride in her work, later writing in her autobiography, Behind the Scenes, that the "best ladies in St. Louis were my patrons, and when my reputation was once established I never lacked for orders. With my needle I kept bread in the mouths of seventeen persons for two years and five months." 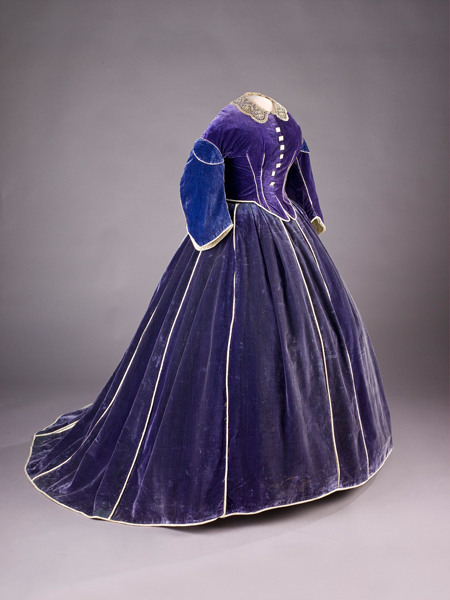 Mary Todd Lincoln wore this purple velvet gown during the Washington winter social season in 1861–1862. It is believed to be the creation of Elizabeth Keckley. In 1855, after years of negotiations, Keckley was able to purchase her and her son's freedom. For the first time in her life, Keckley had the ability to live and work where she wished, and in 1860 she relocated with her family to Washington, D.C. On the eve of the Civil War, the nation's capital was the home of a large and growing free black population, including a vibrant community of African American seamstresses. Despite the competition, Keckley quickly gained a reputation as a gifted dressmaker among the city's white elites. Her client list included some of the city's most prominent families — Varina Davis, future First Lady of the Confederacy, was one of her first regular customers. In 1861, Keckley secured a coveted position as personal dressmaker, or modiste, to Mary Todd Lincoln. As the war raged on, she became one of the First Lady's closest confidantes. Keckley's dressmaking shop produced both elaborate gowns and day-to-day items for clients. 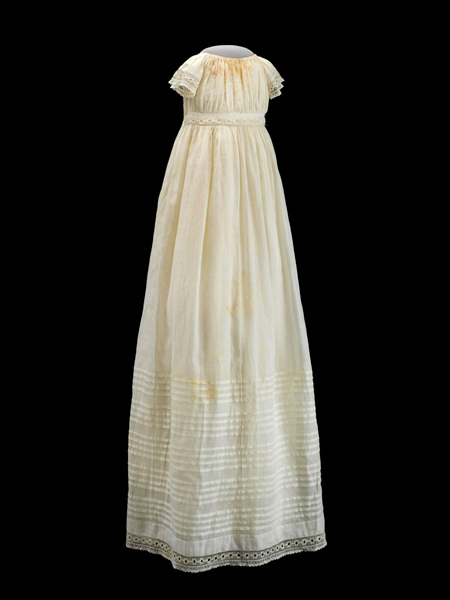 Keckley made this infant's christening gown for her goddaughter Alberta Elizabeth Lewis-Savoy in 1866. Keckley's business created opportunities for many other African American women. Just before she arrived in Washington in 1860, Keckley had tried but failed to train a group of female assistants for a shop in Baltimore, Maryland. In her words, Keckley had stopped for "six weeks, attempting to realize a sum of money by forming classes of young colored women, and teaching them my system of cutting and fitting dresses...[but the] scheme was not successful, for after six weeks of labor and vexation, I left Baltimore with scarcely money enough to pay my fare to Washington." Buoyed by her relationship with Mary Todd Lincoln as well as the general need for labor in wartime Washington, Keckley's business succeeded where her previous efforts had stumbled. By 1865, Keckley employed almost 20 women in her 12th Street shop. Beyond employing other women, Keckley used her success as a business owner as a platform for philanthropy. Wartime Washington faced a protracted refugee crisis. Seizing on the rare opportunity for escape that the war provided, tens of thousands of enslaved men and women crossed Union lines. 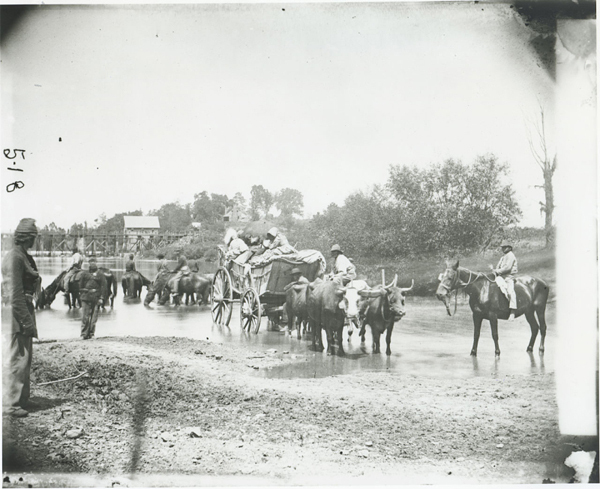 By 1863, approximately 10,000 refugees had reached the nation's capital. While these men and women had secured their freedom, many struggled to survive in makeshift camps and tenements. Moved by these refugees' plight, in 1862 Keckley joined with 40 other members of the 15th Street Presbyterian Church to found the Ladies' Contraband Relief Association. Keckley served as the association's president and used her privileged position as Mary Todd Lincoln's traveling companion to rally support for the association's efforts. While accompanying the First Lady on a trip in 1862, Keckley organized mass meetings at churches in Boston and New York City to support the relief association. In addition to numerous contributions from the president and his wife, Keckley collected money from British anti-slavery societies and abolitionist luminaries like Wendell Phillips, Leonard Grimes, and Frederick Douglass. In her autobiography, Keckley recorded these famous men's contributions and, with equal pride, detailed the anonymous support that the association received from black communities throughout the North. More than "eighty large boxes of goods" were "contributed exclusively by the colored people of Boston," reported Keckley, and the "colored help" in New York's Metropolitan Hotel raised "quite a sum of money" to assist former slaves in Washington. Although Keckley's autobiography created controversy when it was published in 1868, it remains a vital source for historians interested in lives of enslaved women and Washington's African American communities. Sadly, Keckley and Mary Todd Lincoln's relationship soured in the years after the war. Although Keckley had published her autobiography, Behind the Scenes, in part to defend the former First Lady against her critics in the press, Lincoln and many other members of Washington's elite felt that the book represented a breach of trust. Fallout from the book seriously harmed Keckley's business, but she continued to work as a dressmaker in the nation's capital for decades afterward. And she continued to teach others her trade. In 1892, at the age of 74, Keckley accepted a position as the head of the Department of Sewing and Domestic Science Arts at Ohio's Wilberforce University, one of the nation's first black universities. Years later, in failing health, Keckley returned to Washington. The woman who had done so much to assist other people in need spent the final years of her life in the National Home for Destitute Colored Women and Children, an institution that had grown out of the same refugee relief efforts she had led decades earlier. Jordan Grant is a New Media Assistant working with the American Enterprise exhibition, located in the Mars Hall of American Business. He has also blogged about the challenge of depicting the business of slavery in the exhibition.